When Doug Schneider approached me to do a follow-up on the entry-level offerings from Blue Circle, I was perhaps a little uncertain about being able to approach them in a wholly unbiased fashion. My background with audio gear is more from the "belts and suspenders" school of thinking. I firmly admit my love of big power supplies, lots of well-machined metal work, and military-grade component specs. Hence my love affair with Krell, Levinson, Aragon, and their ilk. My reaction to gear such as this can be similar to the effect that donuts have on Homer Simpson: "Arrrrrrrrrrghhhhh" accompanied by copious amounts of drool and severe hormone imbalances. Well, you know, life has a strange way of presenting us with things that force us to think outside our spheres of reference. Such has been the case with the BC21 and BC22. 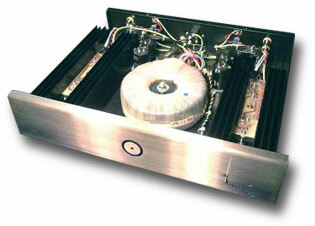 I had originally requested an amplifier of more modest means when I was writing the review of the B&W Nautilus 804s. The primary reason for this request was that my reference amp is the now-discontinued Krell KSA-200S, something that few potential owners of the Nautilus 804s may have at their disposal. I wanted to explore the potential performance of the Nautilus 804s with a level of components that might be more representative of what the speakers would end up being mated with. So here I am. In his full review of the BC21, Ken Micallef covered the salient points of the preamps construction and its sonic signature. His observations about the cosmetics are generally in keeping with my own. I also would prefer to see the unit with stainless-steel knobs, finding the dissimilar materials used now not quite to my taste. Fussy arent we? But one functional thing that became obvious right from the start was the amount of gain available with this preamp: LOTS! I think I would have preferred a slightly different action on the volume control -- I often had trouble finding just the right setting. One nudge up was too much, and one nudge down was not enough. Doh! Perhaps Ive just been spoiled by my reference Mark Levinson No.380 and its 0.5dB incremental settings. Ive heard the comment being made of late that tube gear is getting closer to its solid-state brethren (others might argue that it is, in fact, solid state that has evolved to the level of the "mighty bottle" in terms of musical ability). However, while this may be the case in terms of frequency extension, lowered noise floor, and stability, I think there is still a certain something that happens when tubes enter the equation. This certainly became evident in listening to the BC21. It has a quality that kept pulling me into the music. The BC21 was perhaps not as overtly detailed as the Levinson No.380; however, the BC21 had body and a more fleshed-out quality going for it, hence that magic quality I referred to that tubes still seem to have over even some of the finest solid-state designs. Harry Connicks vocals on "Our Love is Here to Stay," from the When Harry Met Sally Soundtrack [Columbia CK45319], were very focused with a nice sense of body. On this same track, the drums and rim shots were nicely presented and had copious amounts of focus too. The dynamic presentation of the BC21 was excellent. "The Sinking," from the Titanic Soundtrack [Sony Classical SK63213], revealed itself in full splendor, while still maintaining a good level of low-level information within the mix. Perhaps the very bottom end was not as muscular as with the Levinson No.380 in the system (dont ya just love a muscular bottom? ); however, there was fine pitch definition present just the same. I felt that overall the BC21 made a fine account of itself, particularly at its reasonable price point. On to the BC22. OK, this is where the world starts becoming a little unfair and cruel. I think that even just several years ago, an amplifier that offered this kind of performance would set you back a lot more cash than the BC22. Its a true honey of an amp. Its sane, it doesnt run hotter than a BBQ in late July (as a matter of fact, it runs so cool you would hardly even know its on! ), its of modest size and weight, and its wonderfully flexible, offering both balanced and single-ended inputs (both of which can be used at the same time, allowing the user to switch between them via a back-panel switch). Cosmetically, the simple quality of this amp won me over, the stainless-steel front panel sporting the glowing Blue Circle logo followed by the smooth black chassis. And there are no external heatsinks on the unit. 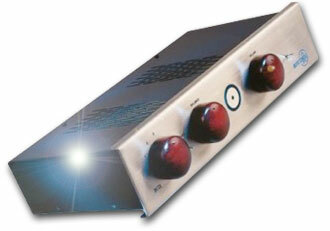 During that time I listened to the BC22, I was surprised by the abilities of the amp. I found it particularly open and detailed through the critical midrange. Voices were well presented and articulate. The treble was smooth and displayed a fine level of detail. Weaknesses? The bass was not as visceral as that of the Krell, or as tightly focused and tuneful. The Krell also bettered the BC22 in terms of fine low-level inner detail and what I want to call "confidence," the Krell sounding like it had a better grip on things. Hardly a fair comparison, you say? I agree. The point of this is not to belittle the BC22 or glorify the Krell, but merely to point out that the BC22 can hold its own in the company of far more expensive amplifiers. Its not perfect -- not the last word in transparency, and there was the occasional trace of glare in the upper midrange -- but it is still able to contend with big-money amps. Together the Blue Circle products created a "music system," as opposed to an "audio system." They each supported the others strengths and to a large degree mitigated the weaknesses. I found it interesting to note that the BC21 smoothed out a touch of the upper-midrange glare I had noticed from the BC22 in my other system. Listening to the Blue Circle products together (interconnects included), I became very aware of what it is that Gilbert Yeung is trying to achieve with these products. At the price point of the BC21 and BC22, compromises have to be made. However, the compromises seldom impacted the enjoyment of music. My listening notes from the sessions kept commenting on the "wholeness" of the sound. The sax solo on the Patricia Barbers "Silent Partner" (Modern Cool [Premonition Records 7412]) was excellent and had plenty of bloom without becoming overly aggressive. Solo piano was presented with fine harmonic fullness, the different sonic signatures of a Steinway and Yamaha being made readily apparent. I was also impressed by the way string instruments were handled, sounding lush and full. It seemed in each case like the natural timbre of real instruments was accurately portrayed. In ways that mattered the most however, the BC21 and BC22 combination succeed brilliantly. The coherence and musical rightness came through in spades and allowed me to connect with the music on many levels. For those listeners in the spectrum of the market occupied by the Blue Circle BC21 and BC22, this pair is worth seeking out. You may just find yourself in a new romance, one that starts and ends with music. Prices: BC21, $1500 USD; BC22, $2150.